The main rule of thumb math education obstacles of your DOE with the math poor 10-25 states of the USA, but MMU1 pilots will demonstrate to overcome them 10-20-30+ times faster than usual. During the MMU1 pilots, Lee will over prove the math average advances by boosting 1-1.8 STDEV, not just 1 STDEV. To boost the math proficiency by about 1 STDEV: Normally this takes many decades to advance the math proficiency 30% to 65% (to raise by about 30-40%). To cut off the math poverty by about 1 STDEV: Or equivalently to reduce the math poverty from 50-60% to 15-25% (in the standards of NAEP or Common Core math of the level 1 or so; to reduce by about 30-40%), this normally takes decades as well. The main highlights about a series of pilot studies called MMU1 (Mini Mini USL1) with Dongchan Lee and why you should collaborate with us early-spring 2017: the more details are given in the tables below. Objective (to boost 1.4-2 STDEV): During the pilot studies of 2 weeks, Lee will take the worst half (25 percentile) of the math students of the grades 2-5 (or even grades 2-7 for the most strongly supportive school districts and the state DOEs) and boost their math average to the best half (about 75%) of the math students in all the participating classes of the schools. Double Speed math learning: both the experimental groups (for the students who attend the MMU1 pilot classes by Lee) vs. the control group (those who attend their school teachers’) will be designed to learn 1 month math class materials during only 2 weeks. 10 classes instead of 20-22 classes. Number of student participations: at least 1k students per grade. As 4-6 grades participate, at least 4k-6k students will participate in total with at least 2k-3k math poorest 50% students with the other equal number (2k-3k) of the math richest 50% of students. Number of school in 1-2 school districts for the participations: if we assume the average of about 25 students per grades or about 100 Primary school students of the grades 2-5 per school, then about 40 schools from 1-2 school districts in your city and state are expected. The school districts with the more student participations will cost linearly cheaper. (normal target scenario) To advance the math average 1.5-2 STDEV: Standard MMU1 operations by Lee for the math poorer half USA states: Lee will take the worst half math students in every participating classes of schools and rapidly boost their average to the best half math of them: 25% average à 75% average of all classes [~50% change]; gains of percent of the current GDP ~ 15-30x. (worse case scenario) To advance the math average 1-1.4 STDEV: 25% average à 50-65% average of all classes [~25-40% change]; the worst math states of the USA to the best of the USA or Japan or Finland; gains of percent of the current GDP ~ 8-13x. (worst case scenario) To advance the math average 0.65-0.9 STDEV: 25% average à 45-55% average of all classes [~20-30% change]; the worst USA math states à the top 25 % of the USA; or the worst 25% state of USA à the top tier of the USA states; gains of percent of the current GDP ~ 4-7x. (worst of the worst case scenario) To advance the math average 0.5 STDEV: 25% average à 40-43% average of all classes [~15-18% change]; the worst 25% USA math states à the top 25 % of the USA; gains of percent of the current GDP ~ 2-3x. In this document, I will mostly deal with the rough rule of thumb instead of getting bogged down by the unnecessary details about the error bars of even 20-30%; this is possible because the economic impacts due to USL x.x series (starting with MMU1) will be annually about magnitude of order difference (10x or more) and the cumulative economic surplus will be 100x ore more. So 1,000%-10,000% surplus is available, we don’t want to get bogged down by 20-30% difference and we do the hand-waving rule of thumb estimations. You’ll see shortly. To raise more credibility about my estimations summarized in the tables below, I would like to include the following rule of thumb estimations, I will include the online, dynamic estimations by Hanushek & Woessmann’s for somewhat similar types of estimations. 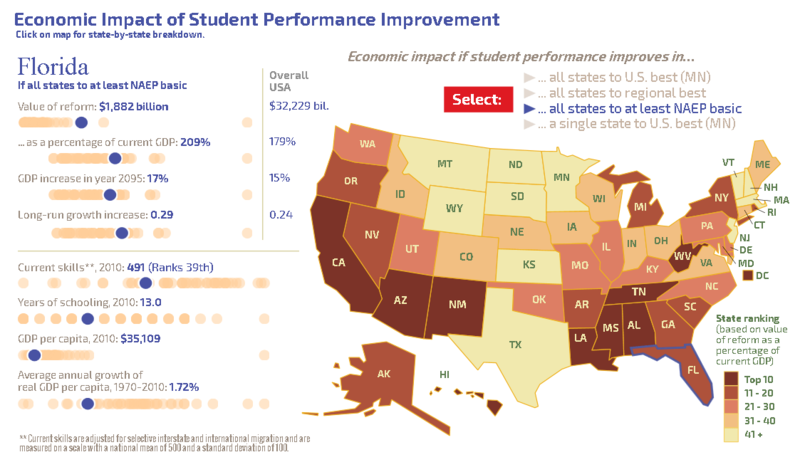 The web link for the math-science proficiency impacts on the USA state GDPs can be found at http://educationnext.org/economic-impact-student-performance-improvement-map-2016/ in this link, you can also download the PDF or PowerPoint versions for every state of the USA. As an example of this, I will put some overall projections for NY state math-science average boost here. We encourage you to run the MMU1 as early as possible because as time goes on, the costs will rise steeply. The first 2 months are very cheap because nobody in the USA knows about it and the demands are none, but once the first rounds of the MMU1 pilots in the USA cities start and the publicities are out, its demands are expected to soar. Depending on the MMU1 cost in time slots, the MMU1 operation costs compared to the typical math class costs in the average USA states for 1 month, initial 2 months will be 10-33 times cheaper than usual. You need to take into account the massive the math skill upheavals of the participating students. Rule of thumb funding suggestions for Lee for 1-2 school districts (bottom line): in the lowest EDU costs of the USA average states, $30/class average costs for 2 weeks (10 classes) may be roughly $30 x 10 classes ~ $300 per student for 2 weeks. à $300/student x 4k/2 math poorest half students ~ $600k except that the math poorest are expected to rise rapidly roughly to the best half math students. More realistic funding suggestions for Lee for 1-2 school districts (commensurate): in the NYC EDU costs of the USA average states, $50/class average costs for 2 weeks (10 classes) may be roughly $50 x 10 classes ~ $500 per student for 2 weeks. à $500/student x 4k/2 math poorest half students ~ $1 Million except that the math poorest are expected to rise rapidly roughly to the best half math students. Access to tablets or computers: to expedite the process, if the participating schools do not have the access to the universal access to tablets to the students, Lee will use the part of the funds to purchase 1k tablets directly or collaborate with the partner(s) who provide the 0.5-1k tablets. The estimated cost of the 1k tablet purchases is about $150k USD, including the tablet protection cases, batter charging stations, earphones, etc. The internet access responsibilities by the school, the school districts or DOE: this is not a part of the cost estimations by Lee.